Some believe that the Fulani emigrated from the Middle East or northern Africa years ago in search of new grazing land for their cattle. Today, the Fulani occupy many parts of central and western Africa. They are grouped according to location, occupation, and dialect. Some of the Fulani travel with their herds, some are settled, and some mix herding with farming. The Bororo Fulani are nomadic herdsmen. The Fulani live in the northeastern region of Cameroon. They have straighter hair, narrower noses, thinner lips, longer faces, and lighter skin than their African neighbors. Also, the Fulani, unlike other African groups, milk their cattle. 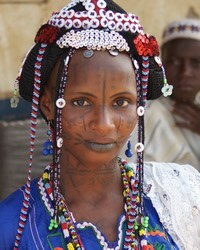 The Bororo Fulani follow the traditions of their ancestors, and are considered the purist of all Fulani groups. These nomadic herdsmen consider long-horned cattle to be a prized possession and have dedicated their lives to caring for their herds. Owning cattle is a symbol of health and well-being among all Fulani. In fact, the level of a man's respect is based on the number of cattle he owns and how much he knows about herding. The cattle have their own names and are treated with affection by the Bororo. Milk is the staple food of the Fulani. Their daily diet usually includes milk, butter, and cheese. Throughout the year, Bororo Fulani travel from place to place with their herds. Each member of the family has specific duties. The men's responsibilities include herding the cattle, tending to political affairs, treating illnesses, and making plans for traveling. The women's duties include milking the cows, preparing butter and cheese, making the clothes and blankets, and preparing the daily meals. They are also required to obey their husband's orders. Although the wife must follow the husband everywhere, she must never be seen in close proximity to him. The men are masters of their households, and women gain their dignity and self-satisfaction from serving and obeying their husbands. The younger boys help their older brothers with herding. The older girls help their mothers and take care of the younger children. Children learn values and Fulani pride from the tribal elders, who are eager to pass down the Fulani traditions. Bororo Fulani feel very strongly about morality, and constantly strive to be generous, honest, and respectful. They are very reserved people, who are shy and modest in public. Family relationships are therefore restrained. Even mothers are not permitted to be with their infant sons, since the Bororo feel that it is inappropriate for affection to be shown in public. The Fulani also have a strong concept of beauty, and believe it to be a distinguishing feature between them and other African groups. Fulani infants receive decorative scars on their faces as symbols of beauty. The children will receive more scarring on their foreheads and noses as they grow older. Infants' heads and feet are also altered to make them more beautiful. The Fulani were one of the first people groups in Africa to be converted to Islam, and today, almost all Bororo Fulani are Muslim. They are a moral people whose lifestyle embraces a high code of ethics. In spite of their devotion to Islam, however, many Fulani continue to observe some of their pre-Islamic practices. The Bororo take great pride in their traditional beliefs and that they have been successful at maintaining their heritage. Unfortunately, they have been deceived into believing that beauty and wealth determine a person's worth. As a result, their children are scarred and their lives are empty of love and affection. The Bororo Fulani need someone to tell them that there is a loving God who accepts them and sees them as precious in His sight. * Pray that the Lord will call forth teams of intercessors who will faithfully stand in the gap for the Bororo Fulani. * Ask the Lord to call people who are willing to go to Cameroon and share Christ with the Bororo. * Ask God to strengthen, encourage, and protect the small number of Bororo Fulani Christians. * Pray that God will raise strong Fulani Christians who can minister love and healing to their neighbors. * Pray that the Holy Spirit will anoint the Gospel as it goes forth via radio among the Bororo. * Ask the Lord to raise strong local churches among the Bororo Fulani.View Fulani, Nigerian in all countries. 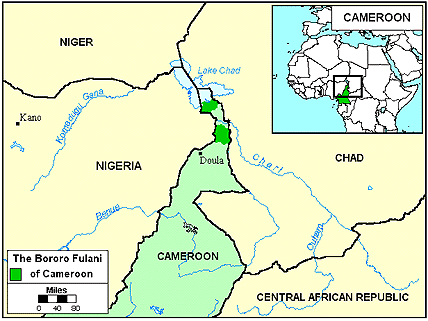 Location in Country: Widespread by clans in Adamawa, North West, and Far North regions; Fulfulde-Jaafun and Fulfulde-Aku varieties are in the North West region.